Below is a high-level overview of the enhancements happening to I-CAR’s programs in 2019 and how they differ from today. All shops regardless of size required only ONE ROLE REP PER ROLE to achieve and maintain Platinum. All required role reps (estimator, non-structural, structural and refinish technicians) must achieve at least PROLEVEL 1 and progress annually. 100% OF STRUCTURAL TECHNICIANS, as well as 50% OF ESTIMATORS, NON-STRUCTURAL AND REFINISH TECHNICIANS must complete PROLEVEL 2 and progress annually. A single individual can represent all FOUR role rep positions. No single individual may represent more than TWO role rep positions. Vehicle Technology Specific Training courses are required for all non-role representatives annually. Up to six role relevant Vehicle Technology Specific Training courses per tech are required for all non-role representatives and role representatives past PROLEVEL 3 on an annual basis. • Effective February 28, 2019 the Road to Gold™ (R2G) program will be discontinued. • Shops that achieve and or maintain Gold Class will be granted two renewal periods to achieve the new Gold Class requirements. Technicians achieve Platinum at PROLEVEL 1. Online classes – one hour or less. SOUND CURRICULUM designed to deliver the information necessary to make complete, safe and quality repairs. Training programs built around KNOWLEDGE AND SKILLS PROTOCOL developed from extensive industry input and design. In-Shop Knowledge Assessments were not offered prior to 2017. Face-to-face conversations that confirms existing knowledge and skills, ELIMINATING REDUNDANT TRAINING for PROLEVEL 1. Welding certification must be renewed every FIVE YEARS. Welding certification must be renewed every THREE YEARS. ALL STRUCTURAL TECHNICIANS must be trained on welding. Welding training for non-structural technicians is optional. Hands-On Skills Development™ Courses offered as optional training. TWO HANDS-ON SKILLS DEVELOPMENT COURSES, Squeeze-Type Resistance Spot Welding and MIG Brazing, WILL BE REQUIRED in 2020 for grandfathered shops, and 2019 for new shops. Technicians must FAX-IN FORM after course completion to I-CAR to receive credit. 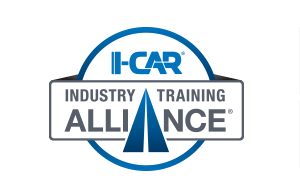 Student credit is AUTOMATICALLY SUBMITTED to I-CAR and APPLIED to their record for Alliance Partner Training provided by Sustaining Partners. NEW INTERFACE to manage all of your training, scheduling and payment needs in REAL TIME. Access online courses on DESKTOP ONLY. Access to all online courses available from DESKTOP AND TABLET anytime. Pricing determined on COURSE-BY-COURSE CREDIT-HOUR BASIS. A LA CARTE BY COURSE – OR – SUBSCRIPTION PRICING FOR GOLD CLASS SHOPS – with options for monthly or annual pricing are available. Subscription pricing is scaled to the total number of technicians at the shop and includes all Live, Virtual, and Online courses for any shop employee.